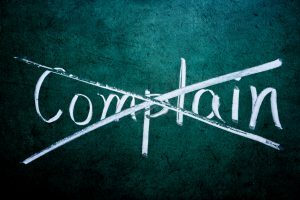 Complaining is toxic and spreads among everyone. The office complainer is that cloud over the team, bringing everyone down – you don’t want to be that person! If you have spent your day complaining to your office buddy, chances are you’re not getting a lot of work completed. Not only that, your drive to get work done is probably minimal, as well. To be frank, perpetual complaining in the office is unprofessional. Your supervisor probably doesn’t like constant complaining and neither do your coworkers. If you have a genuine issue, they are happy to lend you an ear or a helping hand, but if you keep going, you might notice their attention span shortening. The Solution: Stay Positive or Make a Change! As mentioned, complaining is a bad habit, and simply choosing to stay positive will help a lot. However, if your situation at work is bad enough where there is no silver lining, it’s time to make a change. Talk to your boss about why you’re unhappy, or perhaps it’s time to move on to a new position. Either way, you have more control over the situation than you realize. Have an additional tip to share? We would love to hear it, so please leave a comment. This entry was posted in Currently Employed and tagged complaining at work, don't complain, Professionalism, stay positive. Bookmark the permalink.